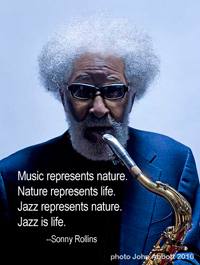 There's little doubt that Sonny Rollins, also the winner of the National Medal of Arts and a Grammy Lifetime Achievement Award, continues, at age 82, to produce music that merits the highest Awards. Each year, JJA voting members are faced with the dilemma of how to honor Sonny's continuing and undeniably "colossal" work while also recognizing other meritorious musicians. So for the 2013 Awards, the JJA decided to honor Sonny with a special award declaring him "Emeritus Jazz Artist: Beyond Voting." 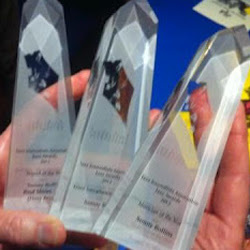 Sonny's Rollins three 2012 Jazz Awards. Sonny is, what's more, not only still recognized for his musical excellence by the professional jazz journalists who make up the JJA, he's still much beloved by his many, many fans. After the JJA sent word to Sonny that he was to be honored with the "Emeritus" Award, he sent us back the wise words that appear in the photo above. We posted the photo on our Facebook page --and it almost immediately went viral, In just a few days it was shared more than 2,250 times. and racked up hundreds of comments, most of which were a variation on "Sonny, we love you!" 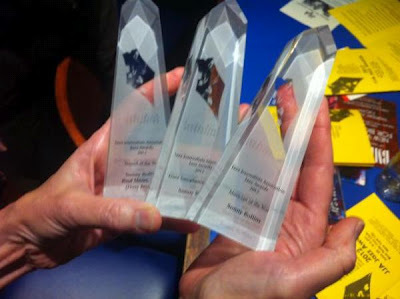 The winners in Journalism and Media categories will be announced at a reception at the Blue Note Jazz Club in New York City on June 19. Ticket information will be posted here soon.